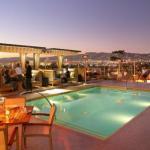 The non-smoking Kimpton Hotel Wilshire is a contemporary boutique property offering a rooftop pool on-site dining and stylish rooms. The seven-story non-smoking Kimpton Hotel Wilshire features 74 rooms and suites where you can relax on a chaise lounge mix a drink from the minibar and enjoy beautiful city views. In-room amenities include flat-panel HDTVs media ports for Wi-Fi and TV connectivity for your personal electronics as well as cozy robes and gourmet coffeemakers. On the landscaped rooftop patio you can refresh in the heated pool lounge in a private cabana or chat with colleagues over cocktails and dinner with views of the Hollywood Hills. Room service is also an option. The business center is open 24 hours a day and Wi-Fi and valet parking are available for an extra charge. The hotel is in the heart of the Miracle Mile/Mid-Wilshire Corridor less than 10 minutes from shopping and entertainment in Beverly Hills and West Hollywood. Downtown Los Angeles Century City and the beaches of Santa Monica and Venice are all within a 20-minute drive. Los Angeles International Airport is 15 miles away.